floppy files to HFE image ? Re: floppy files to HFE image ? Simply image your floppies to .MSA or .ST files first and then convert those to .HFE. Sofar I only converte .MSA and .St files for the .HFE needs and that worked pretty well for me. Though can I convert actual files from my PC to ST files ? IE the floppies I have on my pc are simply file copies, not images.. There are blank HFE files at the HxC site. There is also a virtual floppy driver that makes the blank HFE looks like drive A: or B: on Windows. So you can just copy files from HDD to virtual floppy HFE images. All available are from the HxC website. exxos wrote: Though can I convert actual files from my PC to ST files ? IE the floppies I have on my pc are simply file copies, not images.. I believe the virtual driver in Windows is easier - but Mac users can open 720kb .ST images by renaming them to .dmg and mount them natively. Use the HxCFloppyEmulator app to then convert between .ST and .HFE and back. Nobody noticed that there is a Dos image browser into the HxC Software or what ? -> Click on the button "Disk Browser" ! Jeff_HxC2001 wrote: Nobody noticed that there is a Dos image browser into the HxC Software or what ? I hadn't Apparently I need to make sure I follow your release notices. I found the virtual floppy thing and managed to get my files over to a HFE image that way. Its a bit long winded but does the job I will have to get PCI floppy card for the PC, it was turning into a epic trying to get a USB one to work. I was also hunting to use the floppy cable without it being twisted, as I have to put the cable in upside down, its not long enough to reach, but later released when it means "twisted" cable, it actually means the 4 or so ribbon wires twisted not the entire cable twisted around ? It looks like its caught a few people out. I will make a new cable assuming there isn't any way to use the floppy cable "right way up" ? Why so much hassle when you have just to use the "Disk Browser" function ?! The HxC Floppy Emulator DOS Disk Image Browser is a simplified version of the HxC Floppy Emulator software. This version is designed to replace the VFD solution. - No driver installation needed. - Support of 3 mode DOS floppy disk image (1KB sector size) (For PC98 based CNC machines). - Simple to use ! Copy DosDiskBrowser.exe & libhxcfe.dll to the root of the SDCard with your DOS HFE image files. At startup the software try to load the first HFE image found at the root of the SDCard and display its content. You can select the image to edit with the Disk Selector or by using the "Load Image" button. ->You can get files from the image with the "Get Files" button. ->You can add file(s) & subfolder(s) to the image by a simple drag&drop on the browser window. All modification(s) done on the image are automatically saved when you use the "Disk selector" or when you use the "Close" button. 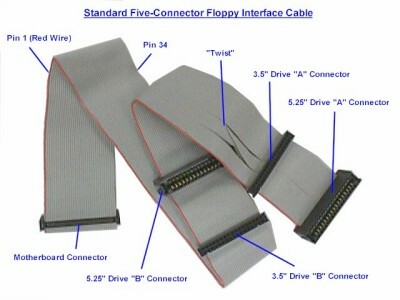 exxos wrote: I was also hunting to use the floppy cable without it being twisted, as I have to put the cable in upside down, its not long enough to reach, but later released when it means "twisted" cable, it actually means the 4 or so ribbon wires twisted not the entire cable twisted around ? It looks like its caught a few people out. I will make a new cable assuming there isn't any way to use the floppy cable "right way up" ? Why so much questions about this ? You can use both (twisted and not twisted) with the HxC. Just change the switch setting and that's all. please check the documentation. exxos wrote: I did run into a odd problem that if the autoboot HFE is loaded, if you managed to end up on desktop you get a bunch of corrupted files listed, though with any other HFE files loaded it all works fine. Not a surprise : This autoboot file doesn't have any file system, like many games in the past . The software in windows does not work with USB floppy drives, it works great with normal internal floppies. The dll software says it will not work with USB drives. There is another dll set which claims does work, but then the emulator software says the dll's are not found as its looking for the other normal dll files. "Drive A" connectors on this pictures are "twisted", others connector aren't. exxos wrote: The software in windows does not work with USB floppy drives, it works great with normal internal floppies. The dll software says it will not work with USB drives. There is another dll set which claims does work, but then the emulator software says the dll's are not found as its looking for the other normal dll files. I didn't talk about floppy drive, but about the way to create/use a blank dos HFE image and add files to this image. To do this the easiest and fastest way is to use the Dos Browser function present in the HxC Floppy Emulator software. That's all. Not sure that 1.39MB as shown at bottom is correct as its a 720K floppy ? The VFD method isn't too much of an issue as I have set this up permanently on my system. It is very similar to mounting ISO images. I believe that the DOS refers to the disk file system the application can read/examine/write and not the target OS of the application. i.e. It is a Windows application to browse DOS formatted disk images. Is it possible to copy from a external B: drive and copy direct to the HxC ? Or any Atari software to load images to the SD card, it all seems to be windows software from what I can see. I think that is possible. The HxC probably only needs jumper configuration to disable drive B: accesses. All operations that can be done with a normal floppy drive (read,write,format...) can be done with the HxC Floppy Emulator in same way..